As an Emergency Medical Technician of four years, Anthony Lupinacci is no stranger to administering Narcan — and knows the difference the drug can make. Lupinacci, a junior studying in Pitt’s Emergency Medicine Program and President of the Pitt Trauma and Emergency League, saw the need for students to learn more about the drug. So, PTEL hosted a Narcan Training event Tuesday, Jan. 23, at 7 p.m. in room 548 of the William Pitt Union. The lecture was in collaboration with the Addiction and Medicine Interest Group, University of Pittsburgh School of Medicine, Pitt’s School of Pharmacy and the Pittsburgh Poison Center. Event attendees listened to Pitt medical students provide background information on Narcan, an opiate reversal agent, and watched as they demonstrated its administration on a human dummy. Pennsylvania has become a national leader in the past decade in deaths related to opioid abuse. According to a 2017 report from Pitt’s School of Pharmacy, the state had a fatal overdose rate more than twice the national average. The epidemic has become so uncontrolled that Pennsylvania Gov. Tom Wolf declared it a “disaster emergency” earlier this month. Lupinacci also said it’s important for people to understand the opioid epidemic issue in Pittsburgh and Western Pennsylvania because it affects their community. According to Lupinacci, opiates depress the respiratory system by binding to receptors in the brain, preventing the human body from breathing on its own. The drug Narcan, however, can bind to these receptors, stopping the effects of the opiates and allowing a person to breathe. Paolo Vignali, a second-year Pitt medical student, spoke about the effects the body can experience when overdosing. To aid in the attendees’ understanding, Vignali demonstrated these effects using a lifelike model. He explained the classic triad of overdose symptoms to watch out for — a drop in the respiratory rate, the inability to awaken from unconsciousness and pinpoint pupils. “So next what we’ll see is an increase in the amount of CO2 being pushed out as people are trying to combat this loss of respiratory drive,” Vignali said. Vignali also said a bystander should first check if a potentially overdosed person can be awakened. If a pain stimuli, such as rubbing knuckles against the sternum, does not work, the bystander should check the person’s chest for breathing movement. A pulse may not register if blood pressure is too low. Students also learned what to do if these signs are present and Narcan is available. 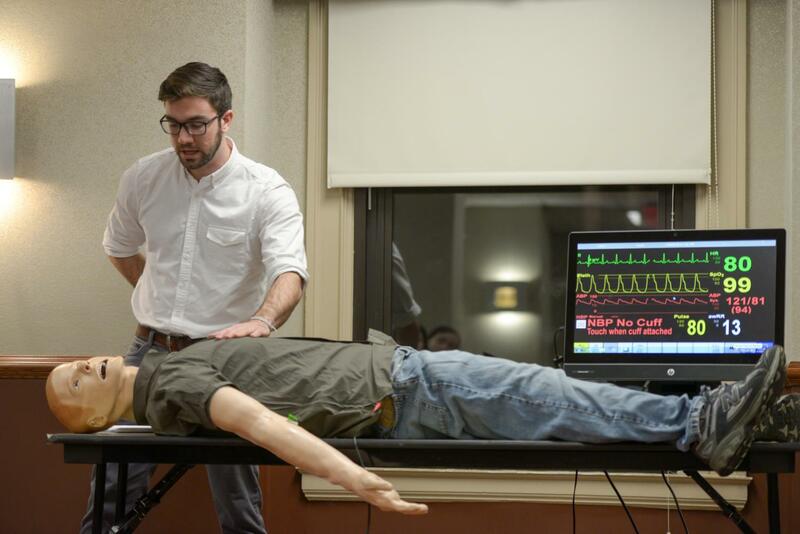 Aaron Landau, a second-year Pitt medical student, demonstrated how to use Narcan on the human model. Narcan you can get from the pharmacist can be obtained and administered in a variety of forms — some are sprayed into the nostrils, while others are injected like epinephrine. Landau warned, though, that people who receive Narcan will experience symptoms of withdrawal. While opiate withdrawal isn’t deadly itself, it can manifest as nausea and muscle cramps because a person no longer feels the euphoric qualities of the opiate. “Narcan might run out and the drug might kick back in. That’s another reason why it’s really important to get this person to the emergency room because they’re going to have to manage the secondary overdose,” Landau said. Maddie Broadbelt, a sophomore microbiology major, attended the Narcan Training event because she knew people who suffered from opioid abuse in the past. She wanted to learn how to administer Narcan, but also found learning about the treatment’s background to be informative. She encouraged other students to attend events like this one because they could learn how to potentially save a person’s life in an hour. “I think it’s [Narcan Training] something that if we can learn how to do it, [if] we can learn how to administer Narcan, we should learn because I’m sure at least some people will be confronted with a situation where they need to use it,” Broadbelt said. Libby Kiefer, an undecided sophomore who applied to the Emergency Medicine Program, also attended the event. As a registered EMT, she found the lecture to be an interesting refresher course. She considered this event important as it sheds light on the opioid abuse issue. Speakers at the event, such as Tejasvi Gowda, a second-year Pitt medical student, emphasized how necessary it is for the public to be aware of how to handle an overdose. She also stressed how far-reaching the issue is.